Our team of expert technicians is highly trained and ready to offer solutions to any problems you're currently facing. Enjoy a new, highly efficient cooling system from Belyea Bros Heating & Cooling! Belyea Bros. Limited was founded in 1908 and has since been a staple to the comfort industry of Toronto and its surrounding region. Since we started, our motto has been "We are big enough to look after you, and small enough to know who you are." We have upheld our close ties to the Toronto community since 1908 and plan to continue doing so for years to come! As the first company to hold a heating license in the Greater Toronto Area, Belyea Bros. has the experience to claim that we are experts in heating older Toronto homes. Our heating company specializes in residential hot water heater systems and rentals, radiant in-floor heating installation, boiler and radiator service, heat pumps and traditional furnaces. We carefully select the heating products we recommend to our customers. We only sell, rent and install manufacturers with a proven track record of quality and service, so we can offer you the best possible support. All the manufacturers we work with have parts centers or distributors within the GTA, meaning we have access to a local support network. We offer only reliable, premium heating equipment. Contact Belyea Bros. for superior heating service, repair and installation in Toronto. With our background as hot water and heating specialists in older Toronto homes, Belyea Bros. has the expertise to plan and execute cooling solutions for houses without ductwork. We install, service and repair a range of A/C systems, including central air conditioning, ductless air conditioners, and our custom designed cooling systems. Regardless of your home’s construction, we can design and install an air conditioner to meet your needs, so you can enjoy cleaner, cooler air. 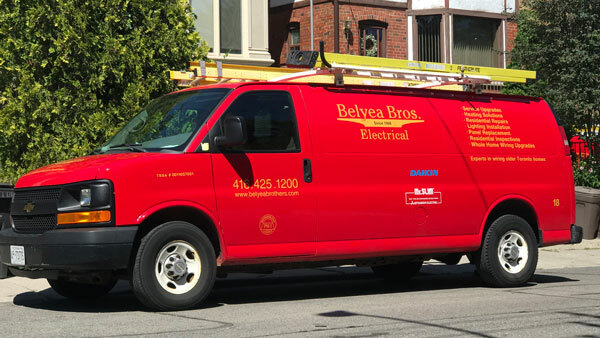 With over a century in the Toronto HVAC business, Belyea Bros. sells and installs only industry-leading cooling technology that you can rely on. Contact Toronto’s air conditioning experts today! Water heaters are the most ignored component of a home comfort system – until they break. With an extensive background in heating and plumbing, our company has the expertise to repair, service and install a range of domestic hot water equipment in older Toronto homes. Whether your home requires a tankless unit, a conventional system or storage tank, Belyea Bros. can help! We even offer hot water heater rentals for homeowners in short-term or tenanted housing. Contact Toronto’s hot water heater experts to learn which water system solution is right for you! For the most dependable and affordable home comfort in Toronto, call Belyea Brothers Heating & Cooling. Our certified team of HVAC technicians services, installs and repairs all makes and models of furnaces, heating systems and air conditioners, including ductless air conditioning and heat pumps. We offer emergency repair service, preventative maintenance plans, and have the experience and expertise to tailor indoor comfort solutions to fit your specific needs. We specialize in heating and cooling service for older Toronto homes. No matter the size, age, or construction of your home, we’ll keep you perfectly cool in summer and perfectly warm in winter. Toronto HVAC Service – Since 1908! We’ve been perfecting home temperature control since 1908, bringing our customers top quality, high-efficiency heating and cooling equipment, and combining it with total commitment to service. Our team of dedicated professionals believes in a personal approach. We focus on each customer, each project, with a single-minded determination to always provide prompt, thorough and exceptional workmanship. For all of your heating, air conditioning and hot water heater needs in Toronto, call Belyea Brothers Heating & Cooling. Belyea Brothers Heating & Cooling holds the first heating license in Toronto. When it comes to solving HVAC problems in older homes, we’re the experts. Our technicians have the training, expertise and product knowledge to fulfill a range of air conditioning services and heating services, including hot water heaters, boilers, radiators, and furnaces, air conditioners and ductless mini splits, and radiant in-floor heating. Whatever it takes to keep our customers comfortable, Belyea Brothers Heating & Cooling exceeds expectations all year long. As Toronto’s heating and plumbing experts, our team of contractors also services and installs hot water heaters. If you live in short-term housing or own rental property, you should consider the many benefits of renting a hot water heating system from a local Toronto heating company. Contact us for service or to learn more about our hot water heater rentals and tankless water heater installation. Belyea Brothers now offers a range of electrical services in Toronto and the surrounding area. Whether you need a repair, inspection or lighting installation, our Master Electrician is here to assist you. Call now to schedule an appointment for electric service.